Eyebrows? I never thought about my eyebrows. They weren’t part of the “head, shoulders, knees, and toes” song and they definitely didn’t make the cut in my Kindergarten family portrait project. As I grew older, I became more aware of those little hairy arches over my eyes…Mainly because many of my middle-school friends had started worrying about tweezing and waxing and threading and taming their brows in one way or another. As a fair-skinned, blonde-haired tween, my brows — unlike my peers’ — were thin and faint. I never touched my tiny, natural eyebrows until I was out of college. While my brows didn’t need much grooming, I felt like they didn’t have enough of a structured shape…so I started plucking. But with eyebrows already so slim, my attempt only made my brows look scrawnier and unbalanced on my face. Thick, bold brows had been celebrated before with the likes of Audrey Hepburn, Brooke Shields and Madonna, yet delicate, pencil-like brows seemed to stay more popular through the ages (Drew Barrymore, Angelina Jolie, and Gwen Stefani come to mind). But eyebrows have become the beauty obsession of the decade. Celebrities like Cara Delevingne and Kim Kardashian started rocking strong, rebellious brows in the fashion world and eyebrow grooming and makeup products skyrocketed. #browsonfleek become the “it” hashtag and, suddenly, mine were nowhere near fleek-worthy. To combat my over-plucked brows, I turned to makeup to conceal my perceived “facial flaws.” It’s funny how women try so hard to remove hair — from our legs, our underarms, our hoo-ha’s — but now I felt the pressure to add the appearance of hair to my face! Pencils, powders, gels, and tints required an artistic hand (I am no makeup guru) and a sweat-free day (a rarity in my career as a professional dancer). I grew so self-conscious of my pathetic eyebrows that making them up became a necessary part of my morning routine…brush teeth, comb hair, pencil in brows — even before a workout class! 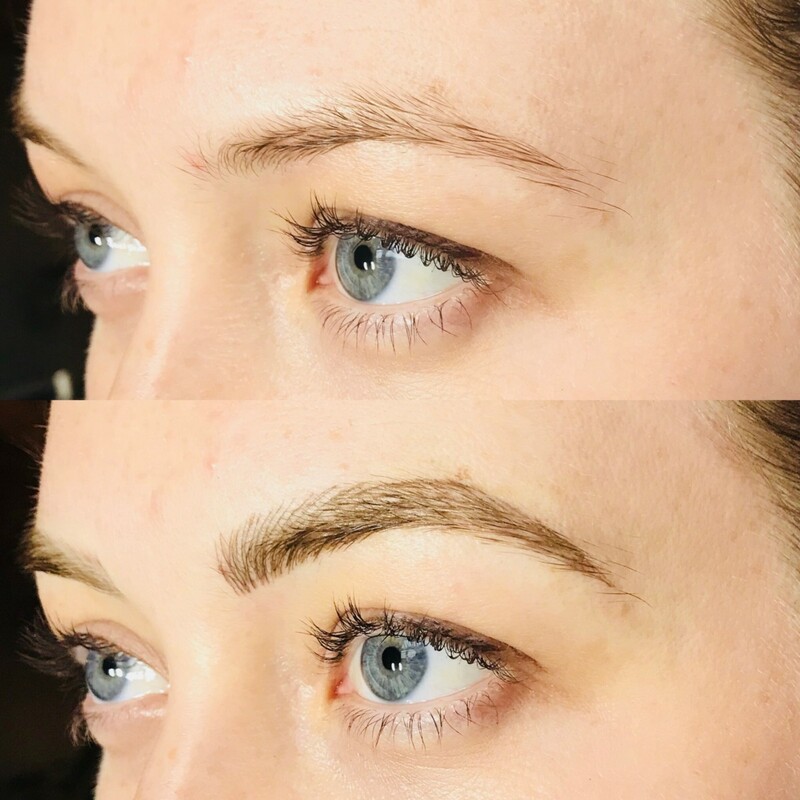 It wasn’t until after I agreed to get my brows microbladed that I actually researched the procedure (naïve, I know, but I was just so excited!). ELLE Magazine describes microblading as a sort of “brow architecture.” It’s about creating the best brow shape for your individual face and features. The technician uses what looks like a tiny “blade” but is actually a line of 10–12 microscopic needles. She dips the blade into pigment and scratches the skin to leave a semi-permanent mark (the needles do not actually pierce the skin like a real tattoo, which is why the semi-permanent results last about a year). A few weeks later, I anxiously walked in for my treatment. Here’s how it all went down. 1. Discussion: Purdie and I talked for nearly 30 minutes about what my “dream brows” would look like. I definitely wanted something fuller and more defined, but still very natural. We decided on a fair shade that was just a tad darker than my natural hair color (4 drops blonde and 2 drops brown). 2. Measurements: Purdie had me sit up facing a bright light and drew a line down the center of my face (right between my eyes). She explained to me how my left brow started further out and had a softer arch than the right. She then placed a piece of tape with a ruler on across my forehead. It took another 30 meticulous minutes for her to carefully align and measure out the perfect outlined shape of two symmetrical brows. 3. Numbing: You have the option to use numbing cream before your first go-around of microblading (there are about 3 rounds). The numbing cream can obviously help reduce the pain of the needles upon skin contact, however the cream takes 30 more minutes to set-in and can slightly smudge the lines that your technician so carefully drew. I nixed the numbing cream…mainly because I wanted to show I was a badass. 4. Needling begins: Microblading creates the look of delicate individual brow hairs. Each time, Purdie dipped the blade into the pigment and carefully dragged it in a tiny stroke on my brow line to create a new “hair.” As you can imagine, this first go-around takes a long time. The pain wasn’t as bad as I anticipated, though my eyes naturally teared up and I had to fight back the urge to sneeze (since your brow ridge is directly connected to your sinuses). 5. Rounds 2/3: Purdie insisted on numbing cream for the next two rounds since she’d be going back over the already microbladed lines and it would be significantly more painful. With the cream applied, I hardly felt a thing! 6. 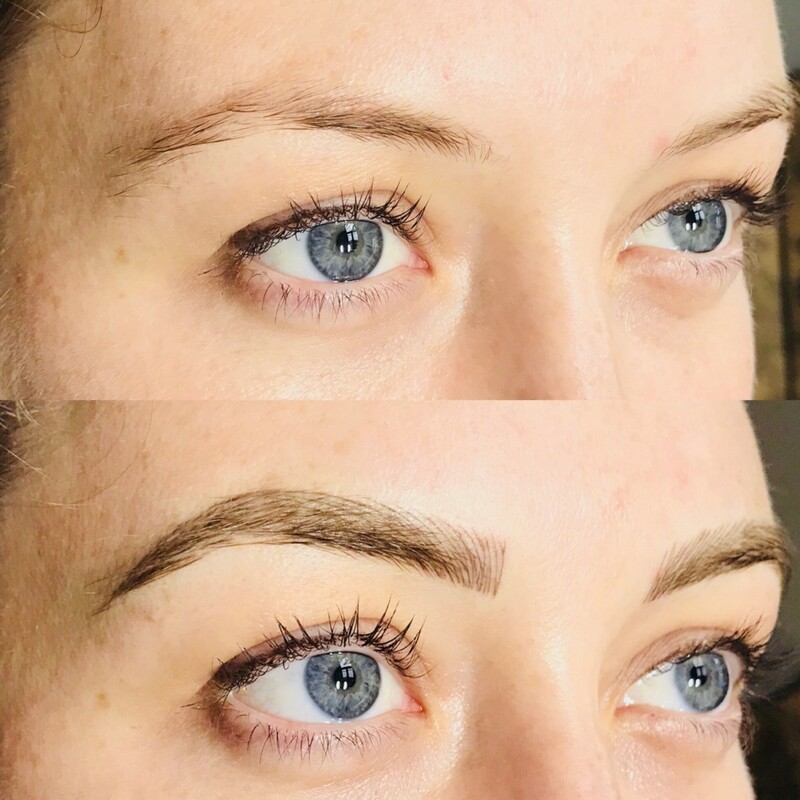 Added pigment: After the three rounds of microblading, Purdie applied pigment all over my brows to provide an even more saturated tint. After about 5 minutes, she wiped it off and we were done! My brows were very sore after the microblading session. They also looked significantly darker and more intense than I had hoped — Purdie assured me that this would subside within a few days. But for the weekend I looked a bit like Oscar the Grouch from “Sesame Street!” The scratches healed over the week and started to “scab” a little. Purdie told me not to pick at or even touch my brows except to rinse them with water and gently apply aftercare cream twice per day. It’s been about two months since my first microblading experience and I am in LOVE with my eyebrows. It’s funny how much a little thing like the shape of your eyebrows — two silly hairy arches on your face — can affect your confidence in your appearance. I love that I never have to do anything to my eyebrows (no more makeup, tinting, shaping, tweezing, etc.). I feel completely confident going out without any makeup on because I feel like my eyebrows somehow carry the rest of my features. My blue eyes seem to pop more, and the heart shape of my face is more apparent. I’ll be going back to Purdie for my “touch-up” session soon and then won’t have to get my brows microbladed again for nearly an entire year! The typical cost isn’t cheap, but to me, it was worth it. Before microblading I would spend about $30/month on brow makeup…that’s $360/year — less than the cost as a microblading procedure (which can run between $400-$800). But, for me, I would spend every morning “doing” my brows (sometimes twice or even three times a day if I had showered after a dance class or was going to a special event). I’ve saved what’s added up to hours of time (and frustration) painstakingly penciling in two eyebrows that never looked quite right. If you feel self-conscious about your meager eyebrows or spent your high school years over-plucking, I would highly recommend looking into getting them microbladed. Research microblading technicians online to find someone you trust. You want someone who is certified and practiced, but also someone who has a meticulous and artistic eye. Microblading can sound scary and intense, but the process is so detailed and the results so natural and beautiful that microblading, I’m certain, will become the next “it” cosmetic procedure.